The first feature by Barbet Schroeder (Maîtresse, The Valley), More created a sensation when it was released in 1969, quickly becoming a cult classic. With his exams a distant memory, German student Stefan (Klaus Grunberg) burns his bridges and hitchhikes across Europe in pursuit of adventure and the warm southern sun. Seduced by the offbeat crowd he encounters in Paris, among them the shyly seductive Estelle (Mimsy Farmer), Stefan is soon flying dangerously close to disaster. 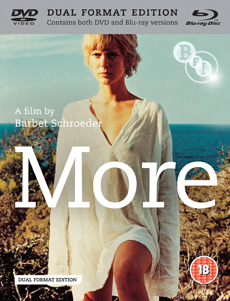 The first feature by Barbet Schroeder (Maîtresse, The Valley), More created a sensation when it was released in 1969, quickly becoming a cult classic. Its subdued and moody Pink Floyd soundtrack features some of the band's most spontaneous and eclectic works – including 'Green is the Colour', 'Cymbaline' and 'The Nile Song'. Director approved high definition transfer from original film elements. Making More (2011, 17 min, DVD only): newly commissioned documentary on the story behind More.